AGTA is pleased to announce several initiatives that will help establish their new home at the Las Vegas Convention Center as a destination venue during Las Vegas Market Week. With their move in 2019 to the new location, AGTA GemFairâ„¢ Las Vegas is delighted to introduce several initiatives designed to drive traffic to the show, enhance both exhibitor and attendee experiences, and create a seamless shopping environment. In addition to offering free Uber rides to and from the LVCC throughout the show through unique codes that will be emailed to attendees and prospective attendees daily, the show is also offering multiple opportunities to win thousands of dollars in credit to spend with AGTA GemFairâ„¢ exhibitors. Additionally, several amenities are being introduced, including chair massages, rest and recharge bars, food carts and a cyber lounge. In order to help facilitate some of the logistics of the buying/selling experience, the show is also offering FedEx services. Following an expansive photo shoot in Chicago last month, AGTA is rolling out a wide-reaching marketing campaign which will be seen in a number of trade publications, as well as within direct mail to attendees. 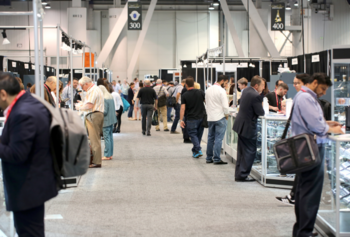 The Collectiveâ€”which includes AGTA GemFairâ„¢ Las Vegas, Las Vegas Antique Jewelry and Watch Show and PREMIERâ€”is being held at the Las Vegas Convention Center May 30th to June 3rd.